Please Note: The paperback edition of this book has been replaced with a hardcover. 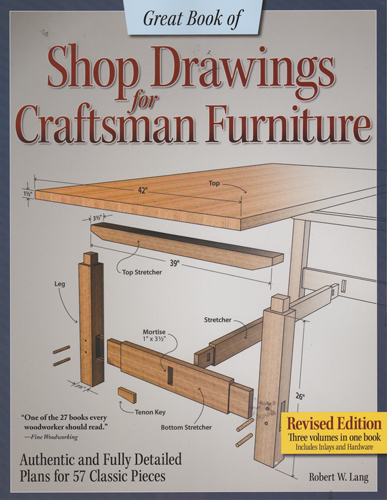 CLICK HERE FOR DETAILS OF THE NEW HARDCOVER EDITION OF THE “Great Book of Shop Drawings for Craftsman Furniture”. The new compilation of my first, second and fourth books, “Shop Drawings for Craftsman Furniture”, “More Shop Drawings for Craftsman Furniture” and “Shop Drawings for Craftsman Inlays & Hardware” is now in stock and signed copies are now available. If you’re a fan of Mission, Arts & Crafts, or Stickley Craftsman style furniture, this new book is a must-have reference for authentic details of the period. Detailed drawings and cutlists for 57 authentic pieces are included as well as drawings for Harvey Ellis inlays, and Stickley hand-hammered copper hardware. The introductory text from the original books has been updated and includes many new photos of both original Stickley pieces and the author building reproductions. Please Note: The original, August 2012 printing of this book had issues of print quality that have now been corrected in this second printing. You can read about what happened (and what we did to fix it) in this post. This book includes drawings for authentic inlays used in Gustav Stickley’s furniture, designed by Harvey Ellis, and period hardware. The inlay and hardware drawings are available on disc in AutoCAD DXF format. CLICK HERE FOR INFORMATION ABOUT INLAY AND HARDWARE DRAWINGS IN DXF FORMAT. The date regarding the original publishing date has not yet occurred ! Also I’d like to purchase the new book but am not willing to play with pay pal !! Good catch! I fixed the date above. I’ve been using PayPal to process online payments for 11 years, without any problems on this end. But I realize not everyone feels that way. If you want to order and pay with a personal check, send an e-mail with your address and a note telling me what you want. I’ll send it off along with an invoice, and you can send me a check. Does the special price (I realize shipping will be different) apply to orders from Canada? Can I still order from the link above? We can do that, but I won’t know the actual costs for a few days. Best way to send is by first class international package, cost should be between $13-$16, which increased dramatically at the beginning of this year. Last year, my cost (which I passed on to Canadians) was $6.75. Thanks Bob. I’ll put my order in and you can let me know what the shipping turns out to be via PayPal. My bad, should be working now. All copies of my books sold on this site are signed. To make the “Great Book” greater, why not just include a disk with the DXF files, it’s an awesome book, the best so far on Craftsman design techniques, philosophy and details. But also pricey, but when one considers it’s three of your previous books in one, it’s well worth it. I for one, think you are more detailed about the hardware in your inlay book than this one, but a disk of the DXF designs attached to either of the books would be much more helpful, while you provide a reference to this site, you don’t mention that there’s a cost involved in getting the DXF files. Not that $20 is all that much, it’s just a matter of convenience. For scanning these from the book, the lines are far too thick to be of use for a pattern unless you convert to vector via centerline methods. But, I bought them anyway, and after investing in 1000 bf. of Quartersawn White Oak, I can’t wait to wear out the spine on this great book and your interiors book, to turn my home into an Arts & Crafts period style showplace, although I am a Frank Lloyd Wright “groupie” as well, so some “prairie” pieces and definitely stained glass will make it in there as well.